Ages 2 - 3. 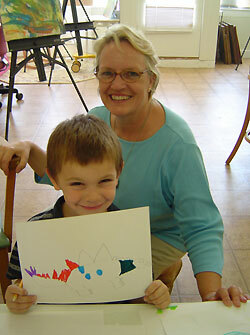 We offer art classes for ages two to three, a fun introduction to art and a school environment. This includes creative projects with safe mediums, story telling and social activities. Most parents stay for this but you don't have to. Ages 4-6. 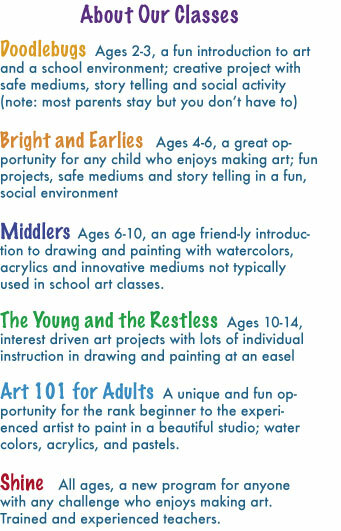 A great opportunity for any child who enjoys making art fun. Fun projects, safe mediums, and story telling in a social environment with other kids the same age. Ages 6 - 10. An age friendly introduction to drawing and painting with watercolors, acrylics, and innovative painting mediums not typically used in school art classes. Ages 10-14. Art projects driven by children's interest with lots of individual instruction and painting at an easel. Art 101 for older students. A unique and fun opportunity for the rank beginner to experienced artst to paint in a beautiful studio. Includes water color instruction, acrylic instruction, and pastels. SHINE is a new program for anyone with any challenge who enjoys making art. We used trained and experienced teachers with students who have special needs.